Bologna is one of the most famous and most beautiful cities in Italy. If you do not know about Bologna, then at least you will have heard of the culinary magic that this Italian city has given to the world. Bologna is home of the famous Tagliatelle, Mortadela, lasagna and, of course, spaghetti Bolognese, which locals call the "spaghetti al ragu". It has earned worldwide recognition for its wines and cuisine Bologna is often called by the "endearing" name – the Fat Bologna. Bologna is located in northern Italy. It is the main administrative centre of the region Emilia-Romagna and the eponymous province of Bologna. This emblematic for Italy city is a beautiful town situated in the Po Valley, as Bologna is surrounded by the currents of Reno River and Savena River. Very close by is the mountainous areas of the Apennines. 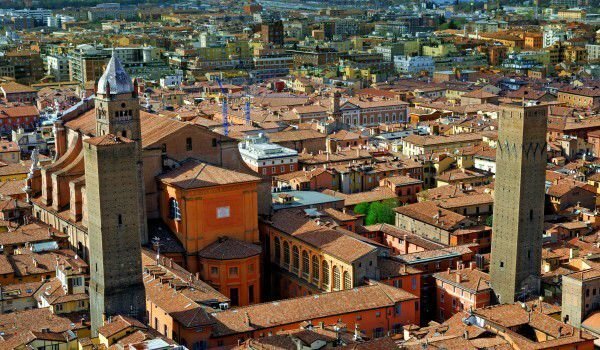 Bologna extends over an area of 140.73 square kilometres and has a population of nearly 400 000 people. Bologna has for centuries been considered one of the most strategic and important cities in Italy. Today, its geographical location is crucial for many of the most important highways and railways in the country. This greatly Bologna helped to be considered one of the most developed and richest cities in Italy today. The high quality living conditions that Bologna offers its citizens ranks along with cities like Las Vegas, Lyon, Sacramento and Canberra. In fact, the name of the town comes from the famous Bolognese sauce, known locally as the ragout. It is a meat sauce for pasta. Because of the location of Bologna in the fertile Po Valley, the rich local cuisine depends on local products and cheese. The region of Bologna is popular with a well-developed local food processing industry that produces various kinds of salami, prosciutto and mortadela. Wine is the other leading product of Bologna, and that has gained fame around the world. The region produces some of the best Italian wine, such as Pignoletto dei Colli Bolognesi, Lambrusco di Modena and Sangiovese di Romagna. Since ancient times Bologna is celebrated as the most fertile wheat and dairy region of Italy. The town's history dates back to 534 years BC, when the village emerged under the name Felsina, it was founded by the Etruscans. The Etruscan city grew around the shrine, which was surrounded by a cemetery and is dominated by a high hill. In the 4th century BC, the city was conquered by the Gaul tribe Boii, hence the ancient name Bologna of the Roman colony founded in 189 BC. The expansion of the early settlement on the site of today’s Bologna has a major role in building the ancient road Via Emilia. In 1088, when Bologna is a rich and independent municipality, there is an open university "Alma Mater Studiorum", which today is the oldest European university. A common practice at that time was for families to raise their own towers as a sign of prestige. As a result, in medieval Bologna there are more than 170 towers, but today there are only few of them. Nowadays, in addition to incredibly good food, Bologna can boast with its beautiful architecture. It is known for its covered streets with arcades, called porticoes. Among the medieval towers that have survived on the square are "Piazza Porta Ravenna" and "Garizenda", which is 49 meters high, originally, it was much higher. Its owners – the family Garizenda made the construction carelessly. They tried to outdo the family Azineli’s tower that reaches an impressive 97 m. The foundations of "Garizenda" were not strong enough, resulting in the tower Bologna tilting 3.2 m from the vertical back. In 1360 the top collapsed. This was done for public safety, and since then the tower is closed for visits. Tower "Azineli" in Bologna is also inclined, although not so much. It was completed in 1110 and today is open for tourist visits. You can climb the 498 stairs that will take you to the most breath-taking scenery you can see in Bologna. In good weather at the top of the tower you can see the Adriatic Sea. Among other attractions that can be seen in Bologna is "San Domenico" (St. Dominic). It was built by Nicholas Pisa, as today you can see some early sculptures by Michelangelo inside. Interesting are also the San Petronio Basilica and "San Stefano" (St. Stephen). Be sure to visit the museum "Museo Chiviko Arkeologico" which has the best Etruscan collections in Italy.